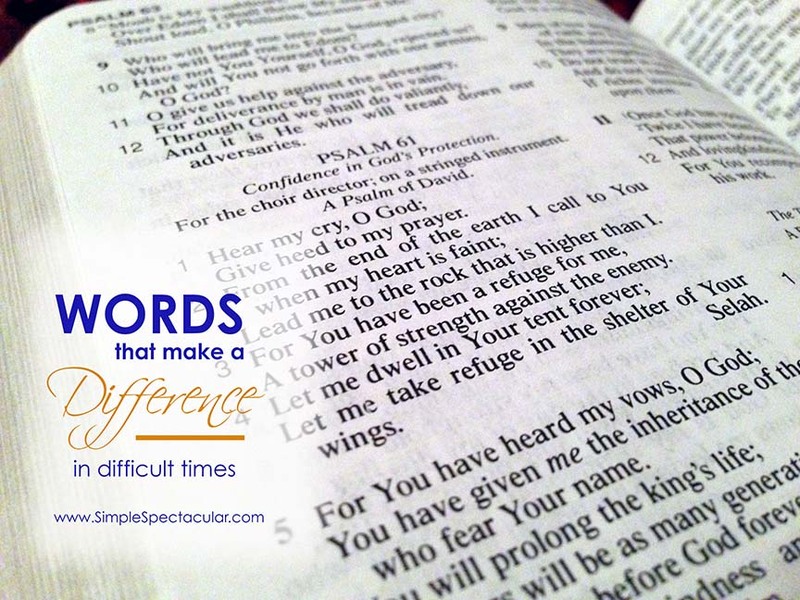 Words that Make a Difference in Difficult Times | Simple. Spectacular! My family of five looks much different than I had envisioned. Instead of two parents holding hands of three little ones, my husband and I hold the hands of just one child. In the last few months, two of our children were promoted to heaven before their birthday arrived. This week has been one of the most difficult I have ever experienced. The same week we had thought we would be welcoming our second child, we instead said goodby to our third. We made the trip to the hospital, but instead of checking in to the “Family Birthing Suites” to prepare to meet our second child, we registered in the short procedure unit for surgery to complete a missed miscarriage of our third child – our second lost baby in six months. My gut reaction has been to crave escape – preferably by either retreating to bed for a long-term stay under the covers or by traveling somewhere where the sun is shining bright enough to make me forget for a few moments. Yeah… really mature and spiritual, I know. But camping out under the covers isn’t actually an option, and I have no magic carpet to whisk me away to a problem-free beach. Face the pain and the empty spaces and the quiet moments and the every-minute reminders and the responsibilities and the mundane and the dreaded return to “normal” – without all of my little ones. God has held me. When we lost our first baby, I could all-but-physically feel His presence and hands enveloping me. This time, I don’t feel Him. So I’m grateful that truth is not dependent on my feelings. This time, I’ve had to search for His truth and His promises and force myself to meditate on them to let truth rise above my fleeting feelings of the moment. His truth allows me to be brave enough to set my feet out of bed and face to dishes and casual conversations and job duties and everything that seems to pale in comparison as my heart is continually screaming out for my two lost loves. What sustains me when I can’t feel God’s presence? Words. I write. I’m a word lover. So it comes as no big surprise that words help heal me. But these Words help me… not because they are pretty, little, encouraging sayings and optimistically empowering phrases… but because they have Foundations under them. They are life-giving… even if it’s just to revive me to do “normal” life again… The power behind these Words is their Author, Who is Truth and Life and Peace personified. So here is my collection of words-that-are-so-much-more-than-just-words that encourage me – no, that sustain and strengthen me – when feelings fail. I hope you find Life in them. Oh Erika! I must have just read an older blog post and am just now reading this one. I’m so sorry! Truly sorry. I am praying for you. Thank you, Abigail… prayers are always appreciated! Erika, I’m so sorry for your loss. I pray The Lord would wrap you up in His mighty arms and give you strength. I pray you and your husband find comfort in His word in this time of sorrow. Please feel comfortable and at ease to let me know if there’s anything I can do. You are in my prayers. I understand not “feeling” Him sometimes, it’s that time that our faith must be strong and do what you have done…cover yourself in His word. If there is anything I can do, even just hug and pray with you, please let me know.